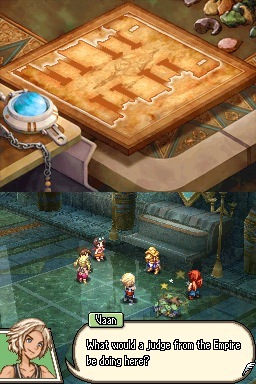 Vaan: Yarhi, hunh? Well, whatever you call ’em, where do they come from? Llyud: The power of the auracite gives them form. 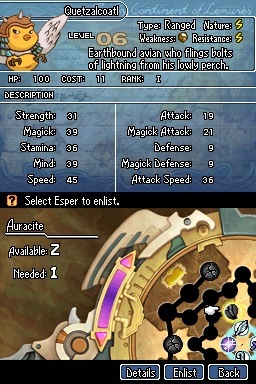 Filo: *hop hop hop* Sounds like treasure! A screencap can’t get across this delightful moment: Penelo turns, clenches her fists and glares at Filo, who wilts under the Wrath of Pen. 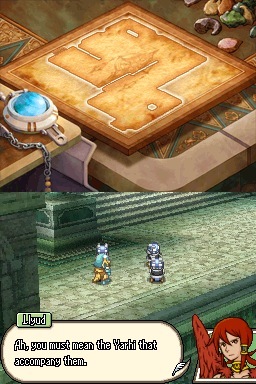 Lluyd: These sky pirates are of the same mind. It is clear they seek the auracite. 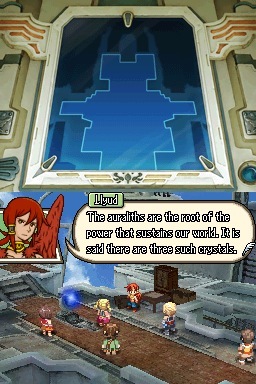 Trust us, Lloyd. We’re the good guys. No really. 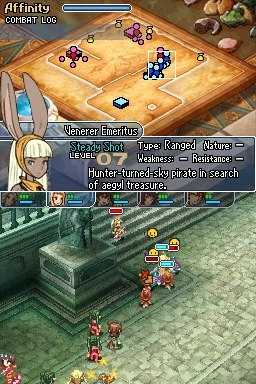 Ack, there’s a viera sky pirate who comes after us while we’re sneaking inside, and she’s got a buncha quetzacoatls as henchcritters. I don’t wanna beat up a viera, even if most of them are Smuggity McSmug! 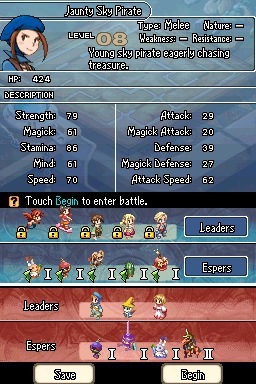 I thought the smiley face meant “don’t attack, friendly party,” but noooo; that’s just the icon for Cheer/Bless in this game. 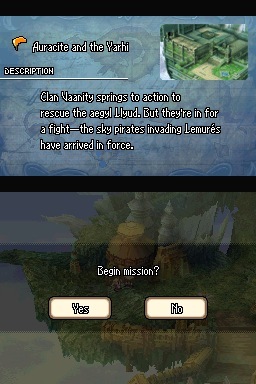 There’s a moogle sky pirate as well. What a name. 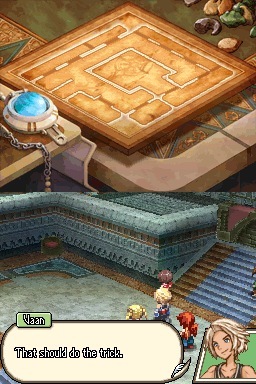 Filo and Kytes go off to play with little Esper buddies while the grownups (ha) dig exposition out of hawk man. 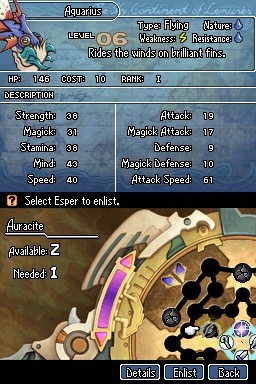 Sounds like Yahri is just a local term for Esper. Llyud: Using auracite, we call them from the realm of illusion to do as we bid. Luckily, Llyud doesn’t seem too honked off about our cultural appropriation. 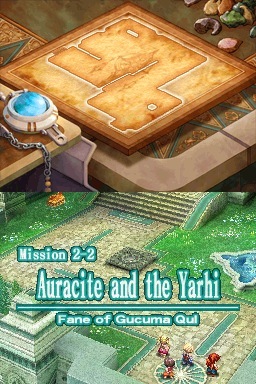 Llyud: But what would a piece of auracite be doing in some underworld ruin? 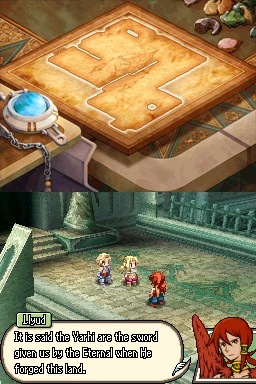 I like the way he keeps referring to Ivalice as “underworld.” Now we know how the Dwarves felt in FFIV. Filo appears to be developing a conscience, none too soon. He gives us a Ring of Pacts. 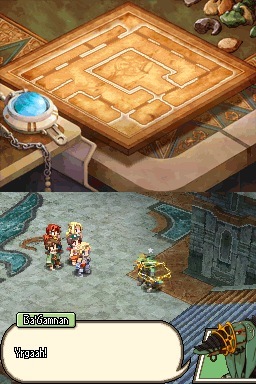 Translation: A sphere grid for upgrading our Troupe with new types of summons. 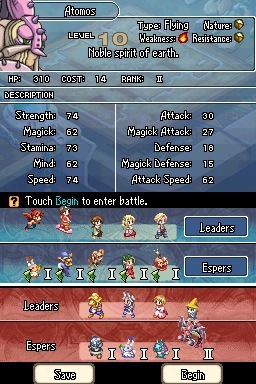 Oh huzzah; we can now add Giza bunnies and have backup healers! Cactoid! 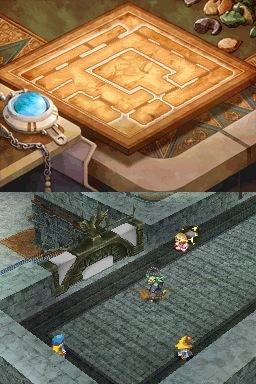 Ivalice has the weirdest cactuars ever. Which is saying a lot. Then there’s whatever the heck this is. Flying fish, I guess. There seem to be a lot of them in FF. 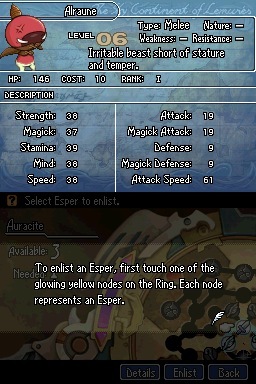 Then we can set up 3 different “troupes” of Espers, awaiting our beck and call. 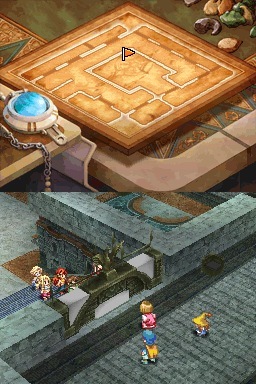 Boy, Yuna’s pilgrimage would’ve been over a lot quicker if it were this easy! 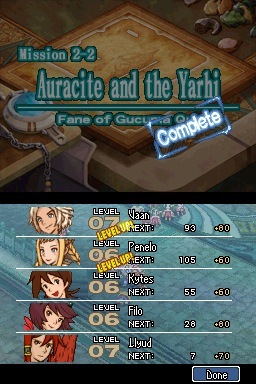 All right, let’s continue deeper into the Fane of Gucuma Qul. Here’s the next mission. 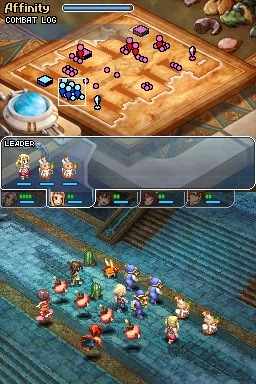 Mission 2-3. Filo is pounding her head, and then her hoverboard, against a solid wall. Um. 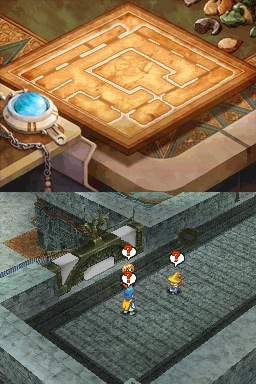 Thankfully Vaan is an old pro and recognizes the giant Push Here To Open red glowing switch. 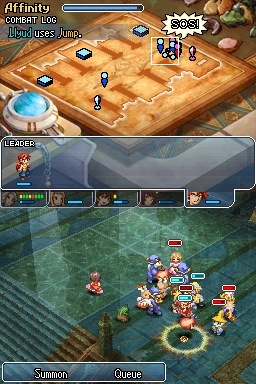 Entering this area, we get a preview of the enemy leaders we’ll be facing. You can just ignore this and jump in, or scout what you’ll be in for. Jaunty sky pirate (not Faris) whose troupe includes a Sagittarius “centaur archer” which looks like an armored unicorn. Filo is so gung-ho it hurts. He runs away leaving us to mop up his centaurs. Jaunty Sky Pirate: You’re a no-good lot, siding with the aegyl over your own! Now for the tough one. Gosh these are teeny tiny graphics. But it makes more sense when they’re moving. 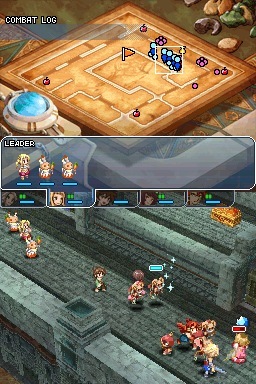 Filo’s learned some sort of snare attack that freezes enemies for a round, useful for getting everybody in range. Also since I’ve found sprint shoes for Vaan, I’m having him run over, go “neener neener,”and run back towards our party, luring away a few enemies out of formation. But she runs off? Hmmm. That’s not suspicious. I really thought she was gonna push this purple switch, open that gate behind us and unleash more monsters. Well, since she didn’t, we’d better. 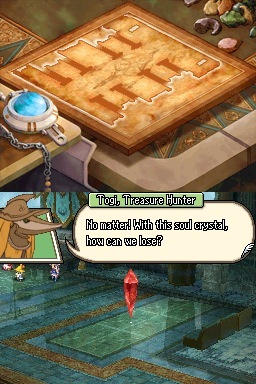 There’s treasures to loot, XP to grind. Hit it, Llyud! Aha, I knew she’d play with the switches. As soon as we go down into the center chamber of the Fane, she sneaks up behind us and presses the switch we just used to seal the door behind us. The gate slams shut. 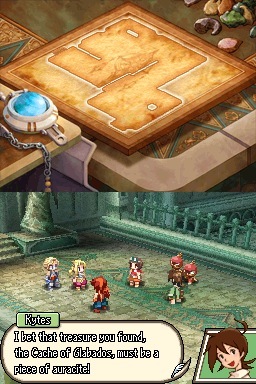 Filo pounds on it while the defeated sky pirates run over and hop up and down making “neener neener” gestures at us. 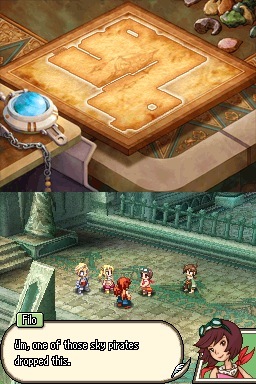 This is like FFX-2: so very not serious compared to its predecessor that I’m getting mood whiplash. But it helps that the graphic style is so different. 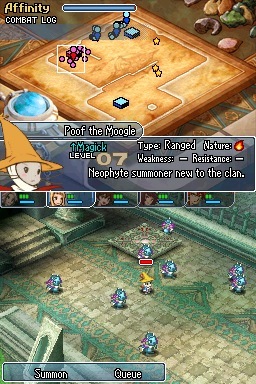 Then the Moogle pirate holds up a crystal and summons a Gigas or Wendigo or something in the room with us. Why didn’t he summon it sooner? Excuse me, it’s Titan. He beats the ground, bringing up his trademark dome of earth and lava (it promptly vanishes). Then he politely waits for us. 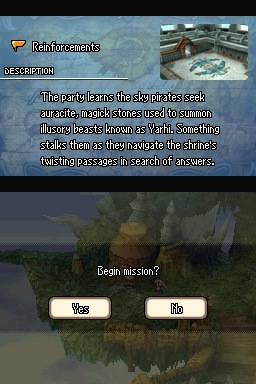 Sounds like a job for our fliers, if I remember my earth elementals correctly! 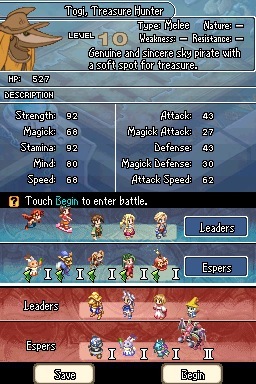 We’re doing pretty well, although the 3 mages are laughing and hopping up and down on the far side of the gate watching it whump on us. 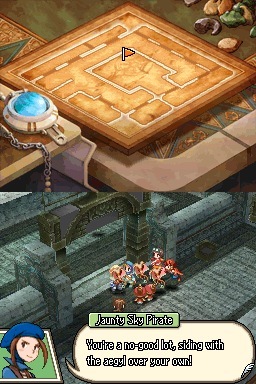 Battle is rudely interrupted by a cutscene! Ba’Gamnan comes dashing in along the same route we took to get here. Not so much stalking as growling and lumbering. The sky pirates hear him coming a mile away. He whips out his best Garland imitation and Knocks ‘Em All Down like teeny weenie bowling pins. 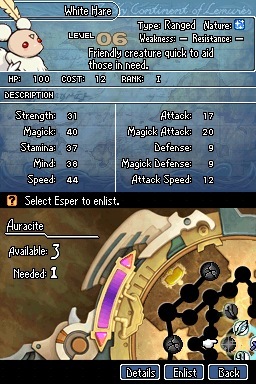 For a moment I dare hope we’re going to have that cheesiest of tropes, Other Enemies Can’t Pick On My Enemy! Bugger. We’re pinned between him and Titan. Ba’Gamnan whips out his bizarre chainsaw tennis racket thingie. Penelo, who was once terrorized by this jerkass, steps forward, as does Vaan, while the children duck behind Vaan. My heart just grew two sizes. There’s a whistle. 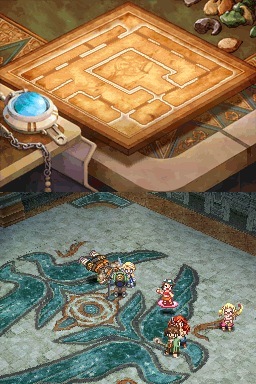 Ba’Gamnan jiggles about, wrapped in ropes of electricity and cartoon stars to denote being stunned. Tomaj, standing on the wall above us, looks very pleased about having corrected his screw-up. 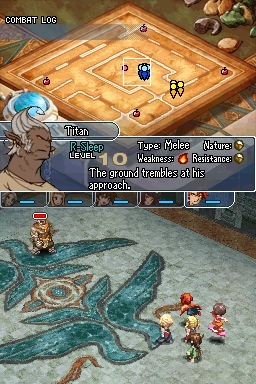 …and rushes over and takes a swing at Titan. Filo: Did you see that!? Call me a pessimist, but I’m pretty sure Ba’Gamnan’s going to make us pay for this later. 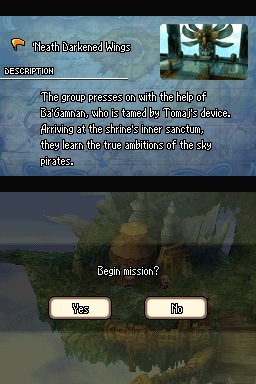 Tomaj: I call it Ba’Gamnan’s Bane. Just a little something I threw together. 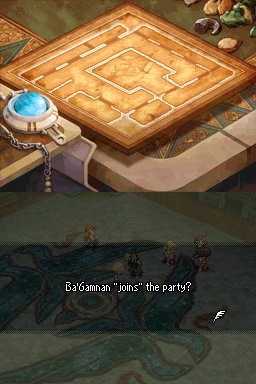 I suppose you could say Ba’Gamnan works for me, now. Go easy on ‘im. 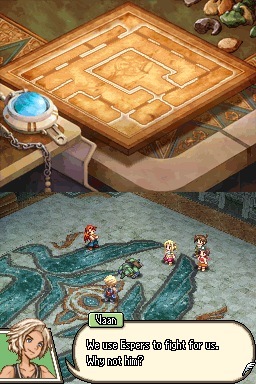 Kytes: I don’t know about this, Vaan. 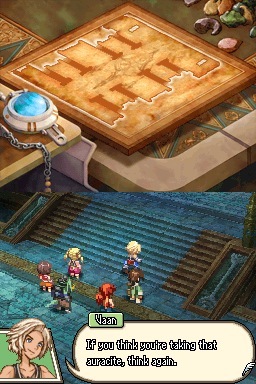 Vaan: Me neither: but I’ll take all the help we can get. I repeat, I do not trust Tomaj farther than I can throw him. He’s shifty. Ba’Gamnan tries to have another go at us after the battle, but Tomaj sends him bouncing about like a pinball, surrounding him with bonds of electricity that seem to hurt. 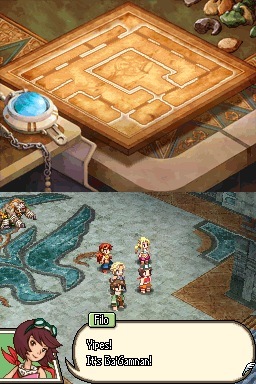 Penelo realizes this is a temporary solution at best. …that argument really doesn’t help much. 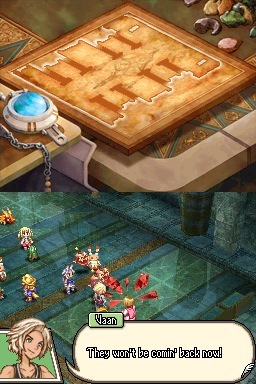 In fact it raises the old bugaboo of whether it’s ethical to exploit summons, too. 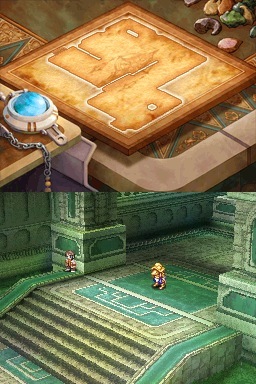 See FFVI, and to some extent FFX where the Final Aeon was enslaved and Bahamut asked Tidus to release them. Clan Vaanity is not impressing me just this second. Kytes: Do you think we can trust him? Vaan: We’ve got him by the tail. I don’t think he’ll give us any trouble. Ba’Gamnan: Brave words, boy. If it weren’t for this blasted muzzle, I’d carve my name in your bones! Vaan: That’s just the fear talking. You can dish it, but you can’t take it. Easy to say when you’re using magic to control someone. 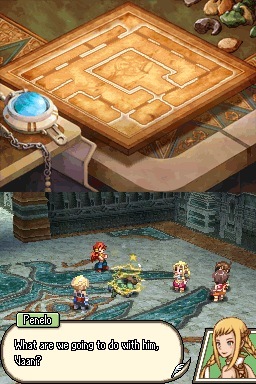 Of course, in the last game, Ba’Gamnan captured and maybe tortured Penelo, so Vaan may be harboring a grudge. He does that. Ba’Gamnan: Enough! Muzzle or no, let’s have at it, boy! Penelo and Kytes sigh at each other. And that’s that. 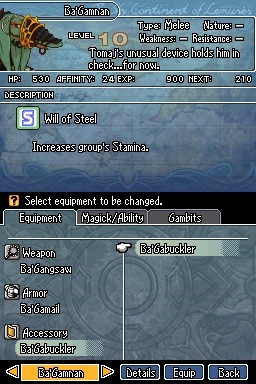 We nabbed more equipment upgrades from treasure chests — earrings, storm lance, armor for Penny and and Vaan, and… my, Ba’Gamnan, that’s interesting equipment you have. Turns out it really is like a sphere grid. 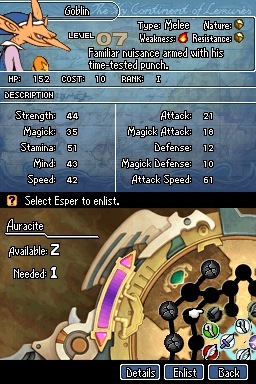 Once you select an Esper of a certain element, the next Esper along the path for that element opens up too (Melee, Ranged or Flying). 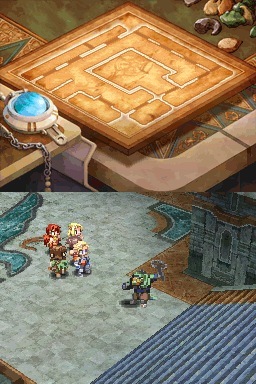 Goblin’s “Time-tested punch” going back to Final Fantasy I.
Hrrm. I need another melee critter, so I enlist Goblin. And Salamander. Okay, back to the adventure! 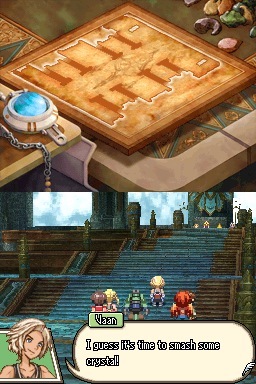 We’ve cleared out most of the sky pirates, but we still haven’t made it to the Fane’s innermost sanctum. What diabolical boss battle lies in store? 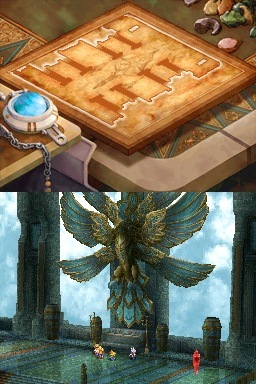 That four-winged bird statue resembles the Vaanity a bit. Coincidence? 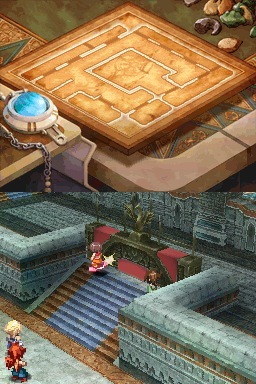 I glare at what looks suspiciously like a red Crystalbug, but it’s something else in this game. 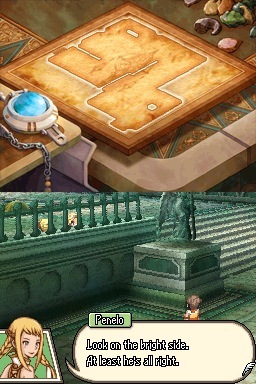 At the base of the looming statue are a quartet of “baddie” sky pirates. 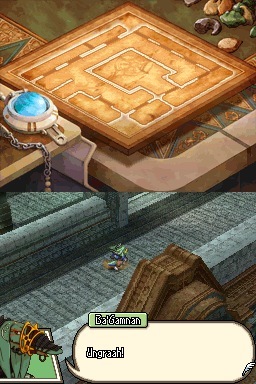 (More FFXII Greatest Hits music: Rebellion). 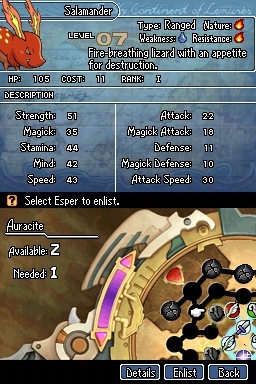 Vaan thinks the red crystal is auracite? Sez the thief who broke into King Raminas’ palace to plunder the Dusk Shard. (Of course that was “taking it back” from imperial coffers after Raminas was dead, so no wonder he’s fighting for the aegyl). 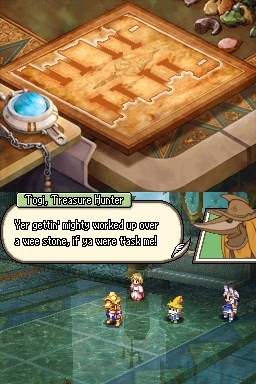 Funny how villains in Ivalice are pseudo-Scottish. Also, is that a badger, or a mutant Bangaa? 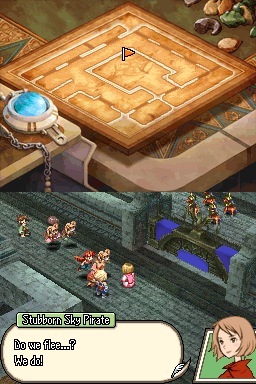 Ivalice has so many sentient races. Lads? Am I finally gonna get to see a male viera? Hard to tell with these pixels. Oh, even better than a save crystal! Gimme! Er. Sorry about the covetousness, Llyud. We’re good guys. No really. No really. Even though we’re threatening to smash up valuable crystals. 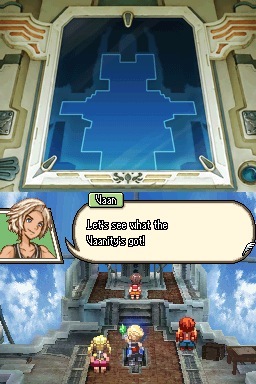 And that is a silly taunt, even by campy game script standards, Vaan. 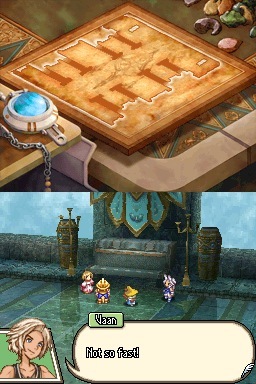 You need to take eloquence lessons from Balthier. Turns out we’re supposed to break their crystal and protect ours. Oh, okay. 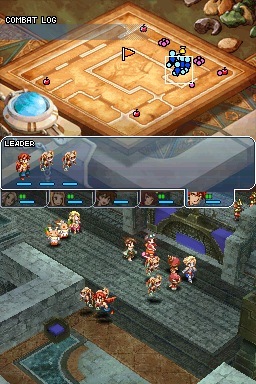 Battle screen time. Oh, that makes him sound so wholesome and decent. Let’s play cribbage or something instead. Here’s Clan Vaanity assembled and ready to rumble! 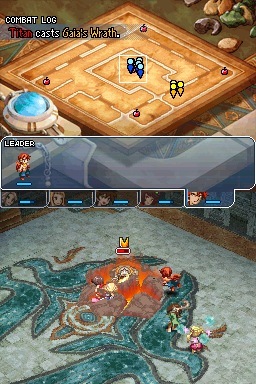 This was a dramatic and exciting battle which required actual strategy. 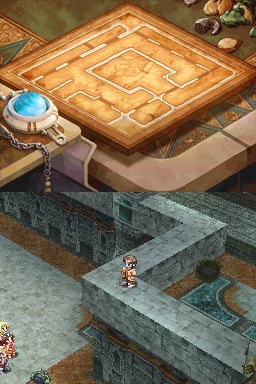 There’s multiple wide staircases with summon platforms at each level that we had to capture, or they’d keep spawning new enemies. 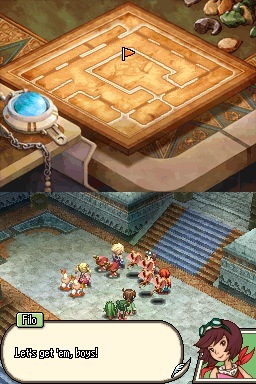 And originally each level was held by foes. 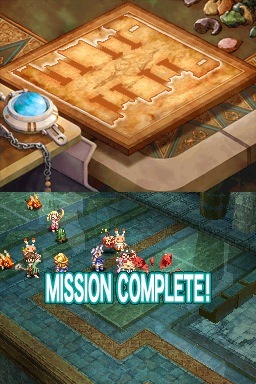 Luckily the bottlenecks allowed us to clear each level, heal a bit, pray until we converted the summons platforms to work for us, and then march up to the next level, making sure not to let anyone pass us, and stopping to summon more Espers to replace those we’d lost. 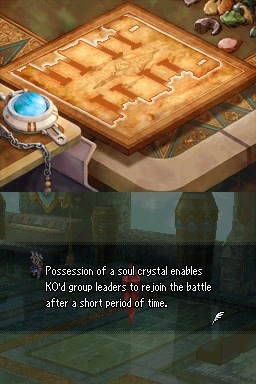 The leaders of the enemies kept returning because their soul crystal would revive ’em. 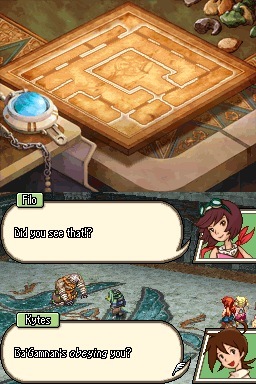 Filo’s close to KO in that screenshot, and there’s a bomb exploding, plus a cactuar casting needles. I’d just pulled Filo back to give Penny a chance to heal her. 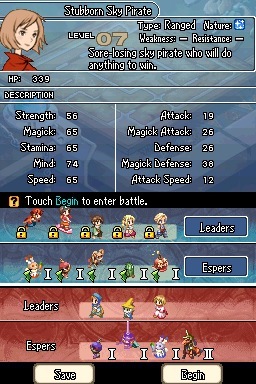 I was struggling to keep up with the pace of battle as my summons kept getting picked off. 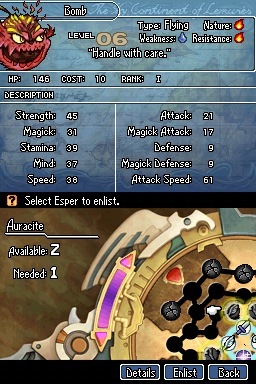 It’s hard to summon and assign Espers to new leaders while fighting and trying to keep combat medics out of the scrum. At last I managed to get Vaan and some backup Espers over to pound on the enemy soul crystal until it shattered. Whew! Victory dance felt earned this time. Penelo: And who gave you the auracite in the first place? Togi: Hrmph! *turns back* You’ll not get another bleedin’ word outta me! 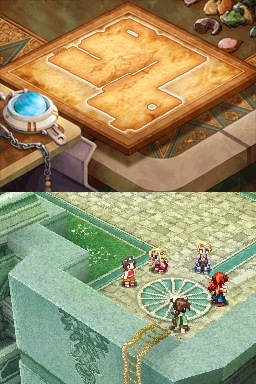 Vaan: All right, Ba’Gamnan, he’s all yours. Togi: I though we were supposed to be the baddies here. Togi: Fine, I’ll tell ya what I want to know, which is little enough. We got the stone we used from a shady character called the Judge of Wings, ya follow? I don’t know who or what she is, and that’s the truth of it! Ba’Gamnan starts to take a swing at him anyway, and Tomaj electrocutes him again. Urgh. 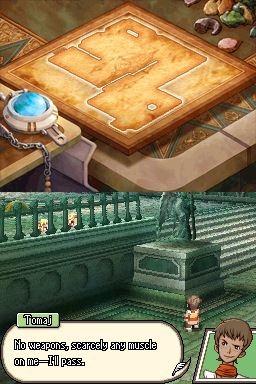 Vaan takes “judge” rather literally. Togi: They wouldn’t be doing anything here! Who said anything about the Empire, anyway? 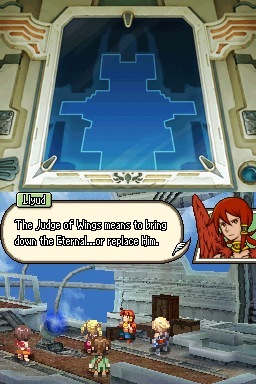 This Judge of Wings is all done up in armor with wings on the back, so that’s what we call ‘er, ya follow? 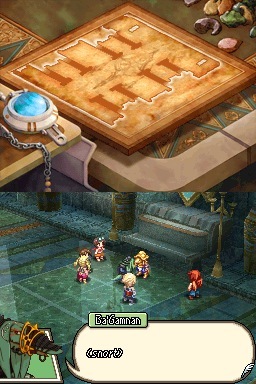 Vaan: So who is she? Hrm. So it wasn’t the destruction of the Sun Cryst that took out the barriers after all? Togi: She sits in judgment of all life…and death. 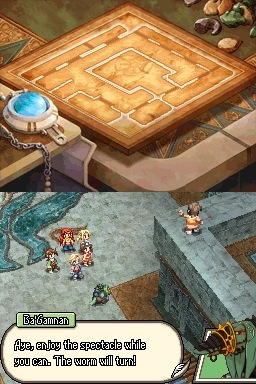 Penelo: What’s this about invading Ivalice? Togi: None of us put much stock in that. 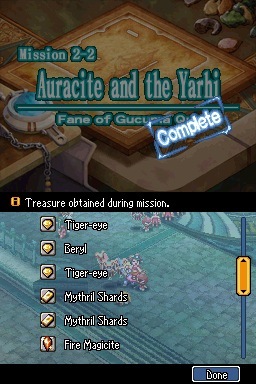 We’re just along for tha auracite, heh. Filo: Then this judge is the one we’ve gotta stop! Kytes: Shh! Don’t give ’em any ideas! 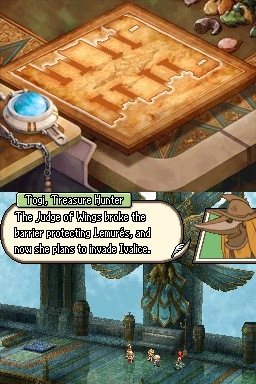 Query: Why is a powerful Judge of Wings hiring two-bit sky pirates to do her dirty work? Togi is chatty now; says they were hoping to find a giant auricite crystal called an auralith— but then he bolts. Tomaj is waiting outside the entrance, takes cover, and doesn’t do a thing to intercept him. Tomaj shrugs. Some help you are! 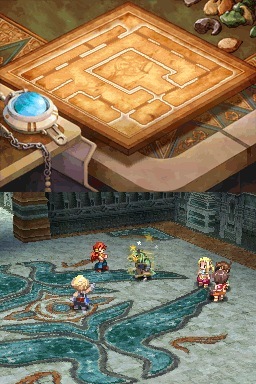 Emerging from the Fane, Vaan asks Tomaj why he didn’t stop Togi. Tomaj protests he’s not a fighter. 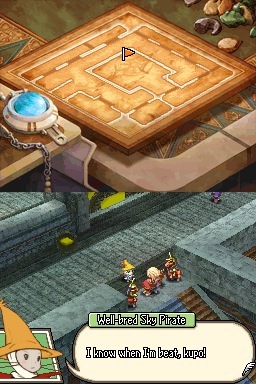 Yeah, you’ve just got a device to stop the most powerful bounty hunter in Ivalice, eh? Shifty, shifty, shifty. Still think he’s Jules’ cousin. But I suppose cowardice is why he survived and thrived during Imperial occupation. 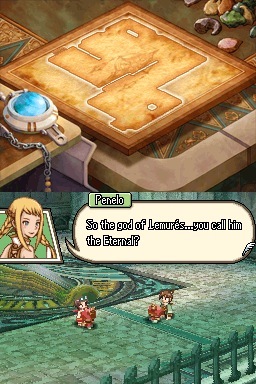 Penelo, ever the generous-hearted one in the group. 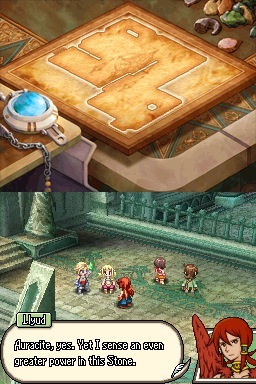 We head back to the airship for a bit more exposition. Llyud: Their story begins many thousands of years ago, when the Eternal created this land. His proper name is Fe0lthanos the Eternal. When He created Lemurés, He used the three auraliths to create a barrier to protect us. Feolthanos lives even now, standing watch over Lemurés, sheltering us from harm. 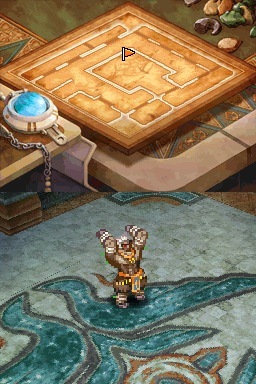 Filo: No way… How can he still be alive after thousands of years? Vaan: Anyone trying to become a god’s got his armor on too tight, if you ask me. 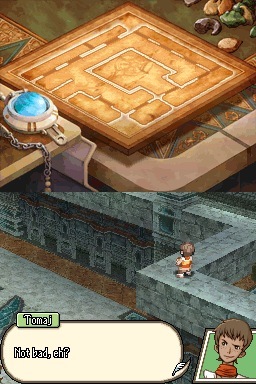 And we’re off to the next sky island, where Llyud knows the location of one Auralith. We’re gonna protect it so the Judge of Wings can’t get it. 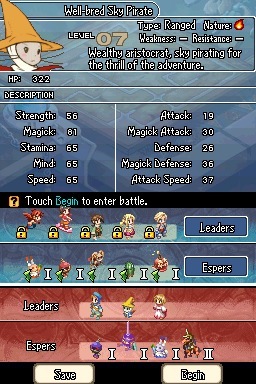 Just like Cecil and friends trying to protect all the crystals in FFIV, or the Warriors of Light in FFV. I’m sure we’ll be just as successful. 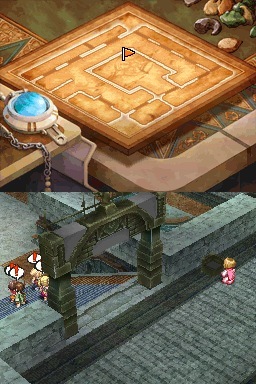 This entry was posted in Final Fantasy XII: Revenant Wings, Let's Play... and tagged crystal, ffxii, revenant wings. Bookmark the permalink.